David Hockney is one of the world’s most popular artists. He lives in Los Angeles. Martin Gayford’s many books include Rendez-vous with Art with Philippe de Montebello. He lives in Cambridge, England. Rose Blake is an illustrator and the daughter of famous artist Peter Blake. She lives in London. "A brilliant, knockout collaboration—one that will continue to excite, provoke, and engage kids and their grown-ups." "A lively, curious, and deeply informative book about art"
"The authors’ knowledge and insight, shared in clear, straightforward language, helps readers understand how various artistic techniques and tools have been similar through the ages." "Famed contemporary painter Hockney, along with art critic Gayford, offer an inviting, pleasant stroll through art history in this colorful, winsomely illustrated volume . . . Blake’s genial, bright cartoonish art, scattered throughout the page, adds to the welcoming atmosphere . . . the tools Hockney and Gayford use to talk about everything from prehistoric handprints to iPhone photography will spark kids thinking about what constitutes art." "Contemporary British artist David Hockney and art critic Martin Gayford join forces to look at art using a fresh spin . . . This is an appealing new way of looking at artwork." 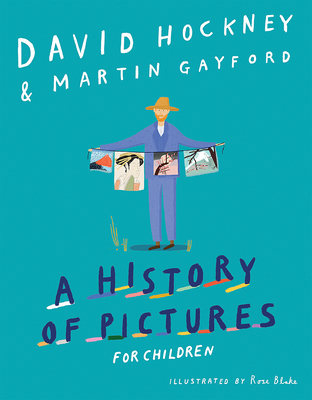 "A History of Pictures for Children offers a captivating survey of art that ranges from cave painting to Neolithic times to the modern self. Blake's engaging design forms the background--great works of art constitute the foreground--for an accessible yet highbrow conversation between artist David Hockney and art critics Martin Gayford."